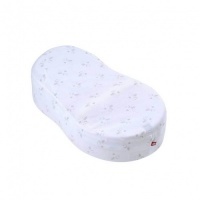 The Redcastle Ergonomic Baby Wedge sleep positioner has many of the benefits of the Cocoonababy but in a pared down design that will fit in a moses basket / crib / stroller or cot bed on the lowest setting, and is perfect for travelling (with its own carry bag). It supports your baby in a slightly curved shape and at a slight incline which is the best position for your newborn's first months and because it feels womb-like, it will reassure and calm them for a better night's sleep. Improves the quality and duration of your baby's sleep by offering a reassuring and comforting closeness thanks to the semi-foetal, slightly rounded position which feels womb-like for your baby. It can also limit your baby waking themselves from the startle (moro) reflex which is a natural newborn 'jerk' that can happen while your baby sleeps and can sometimes wake them up. It can limit the onset of some adjustment disorders such as reflux problems because of its slight incline of 7% and hip flexion both of which helps limit reflux symptoms. The sleeping environment compliments your babies all round development by keeping your baby gently flexed, which allows freedom of his head and upper body movements (baby’s hands can come up to his face and his legs are in gentle slightly flexed position with their knees bent and higher than their buttocks). This is the ideal position for a new babies all round development. Suitable from birth (from 2.8kg/6 lbs 3 oz) to 3/4 months - it can be used safely until your baby starts to roll by themselves - usually at 3+ months. 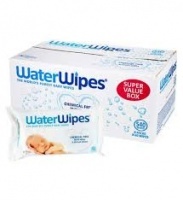 STOP USING THE PRODUCT as soon as baby shows signs of wanting to turn over or to adopt a different position. Monitor the child’s position in the product constantly. away from home, as a baby travel mattress. Warning: To prevent the risk of a fall, never place the product on a high surface. 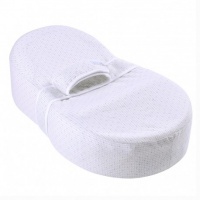 Installing in the cot: Do not use a cot bumper with the Ergonomic sleep positioner. Care: Removable cover, machine washable at 30°. Compact and easy to carry – includes transport bag. Designed in collaboration with a paediatric physiotherapist.